This chunky summery salad is quick to make and packed with protein. The wholemeal pitta makes a high-fibre accompaniement. With a GI of 45, this meal is <a href=_http_/www.bbc.co.uk/food/collections/high-protein_low-gi_recipes__high.html protein, low GI</a> and provides 374 kcal per portion. Put the onion, tomatoes and cucumber in a bowl and season to taste. 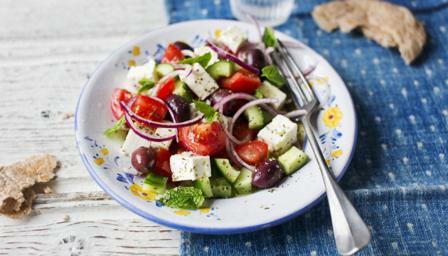 Scatter the feta, olives and mint leaves on top. Sprinkle over the oregano and toss lightly. Drizzle over the oil and lemon juice and serve with warmed pitta bread.